Dasistoma macrophylla (Nutt. ) Raf. Leaves: Opposite, lower broadly ovate in outline, 6 to 14 inches long, 3.2 to 8.8 inches wide, deeply pinnately cleft or twice pinnately-compound; divisions broadly lanceolate, margins toothed; upper leaves reduced in size, becoming lanceolate, sometimes entire. Inflorescences: Raceme, elongate, spike-like; flowers in leaf axils, stalks short, club-shaped; bracts leaf-like, opposite. 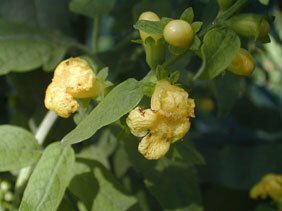 Flowers: Calyx bell-shaped, 1/4 to 2/5 inch long, 5-lobed; lobes egg-shaped, to 1/5 inch long; corolla narrowly bell-shaped, 3/5 inch long, yellow, weakly 2-lipped, tube densely soft-hairy within; lobes 5, nearly equal, widely spreading, broadly rounded, 1/5 to 1/4 inch long; stamens 4, arranged in 2 sets; filaments bearded; stigma 2-lobed. Fruits: Capsule, rounded, 1/4 to 1/2 inch long, veiny, dark brown; seeds numerous, angular, 1/10 inch long, dark brown. Habitat: Rich, moist woodlands, stream banks, thickets, and rocky slopes. Comments: The corolla usually lasts only about a day. Mullein foxglove is partially parasitic on the roots of elm, buckeye and other trees.